On February 19th BlackBerry finally released an OS update for their existing in market phones, making OS 10.3.1 available to customers beyond those using the BlackBerry Passport. A few carriers (such as Verizon) are still dragging their heals, but the new OS is now an option for most. Traditionally BlackBerry 10 users have been very quick to adopt new OS versions, and initial results show that 10.3.1 is no different. First a disclaimer. The following data is presented on a per day basis, making the sample sizes relatively small. In an attempt to make the sample sizes as large as possible data from across different apps have been merged together into a single data set, which itself can have an effect on the data. As a result the data is a bit more messy than the monthly averages I typically post. Even over this short period of time the update of 10.3.1 is very noticeable. 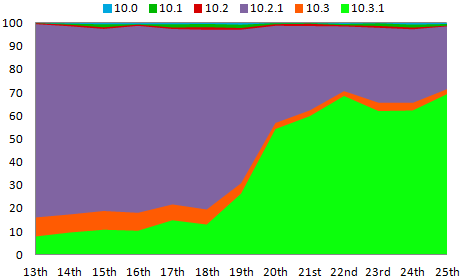 In the six days before the 19th only 11.2% of users were running the newest OS, while that number jumped up 62.6% in the six days following the 19th. This data was collected by BlackBerry World for downloads of all Ebscer apps that support BlackBerry 10. Data shown on the chart is from the February 13th, 2015 through February 25th, 2015.